Naturally there has been a lot of talk and analysis of the speeches by Abbas and Netanyahu at the United Nations last week. The following letter from a friend of mine sums up the reactions of so many. What is it about “Let's sit down and talk” that Mahmud Abbas doesn't understand? Democracy (never mind the fact that he hasn't allowed elections for the last two years because he's afraid he'll be booted out of office). The colonial occupiers (never mind the fact that Jews have a historical claim to the Land of Israel that goes back 2,500 years). The plight of refugees (never mind the fact that more than 850,000 Jews who had lived in Arab countries for centuries were evicted from their homes when Israel was established). In the wake of this speech, the Quartet then proposes that the Israelis and Palestinians meet within a month with an agenda for talks. The prime minister of Israel says Yes. What does Abbas say? What the Palestinians have always said. "No". That No is just another is a series of Nos that began in Khartoum in September 1967 when, at an Arab League summit, a resolution was issued calling for "no peace with Israel, no recognition of Israel, no negotiations with it." In 2000, Israel and the Palestinians signed the Oslo Agreements that would have established a Palestinian state. When the terms were about to be implemented, what did the Palestinians say? No. In 2008, Israel unilaterally withdrew from Gaza with the goal of moving toward the establishment of a Palestinian state. What did the Palestinians say? No. This is beginning to sound like a scenario in a marriage counselor's office. One spouse drags the other to therapy. When prompted to talk about the problems between them, the second spouse folds his or her hands and says, No. Why? Because deep down, the second spouse doesn't want the marriage to work. He or she wants the spouse to just get out of the house and leave it, all of its furnishings, and the bank account to him or her. Deep down, what Abbas wants is not independent ownership of part of the house. He wants the whole thing. About one billion people across the planet live in slums. International development organizations have been investing resources and efforts in tackling this issue, as one of the United Nations' Millennium Development Goals is to "achieve significant improvement in lives of at least 100 million slum dwellers by 2020." But despite some successes, the situation has continued to worsen as rural-urban migration and natural demographic growth continue to aggravate the problem. Enter Israel's Weitz Center for Development Studies in Rehovot, which provides month-long training courses on upgrading poor urban neighborhoods and communities. The program is sponsored by MASHAV, Israel's Agency for International Development Cooperation. In July, a group of 31 participants from 15 African, Asian and Eastern European countries came for a session, representing such countries as Kosovo, Montenegro, Ethiopia, Nigeria, Uganda, Myanmar and Thailand. Palestinian refugees will not become citizens of a new Palestinian state, according to Palestine’s ambassador to Lebanon. From behind a desk topped by a miniature model of Palestine’s hoped-for blue United Nations chair, Ambassador Abdullah Abdullah spoke to The Daily Star newspaper in Lebanon last week about Palestine’s upcoming bid for U.N. statehood. Let us just remind ourselves that when 700,000 Jews were kicked out of the Arab countries, many with only the clothes they wore, Israel immediately took them in and gave them citizenship. Sorry, but whether there are left wing or right wing politics at play, this is incredible, this is an Alice in Wonderland scenario. With groups pressing for the deligitimisation of Israel and boycott campaigns against Israeli products, it is interesting to note that the majority of the world sees Israel as a positive partner in so many fields. The latest was last week when Israel signed an agreement in Geneva with CERN, the European Organization for Nuclear Research, becoming an associate member of the organization, in preparation for its acceptance as a full member. Ambassador Aharon Leshno-Yaar, Permanent Representative of Israel to the United Nations Office and other International Organizations in Geneva, signed the agreement on behalf of the government of Israel. The signing of the agreement with CERN is the climax of a long and challenging process by various Israel government ministries (Ministry of Foreign Affairs, Ministry of Industry and Trade, Ministry of Science, the Planning & Budgeting Committee of the Council for Higher Education, and the Prime Minister's Office), and must be ratified by the Knesset. I received the letter below from a friend at a hospital in the north of Israel and I think his views represent a majority of opinions in this country. I, therefore decided to publish it as received. So, what does this have to do with Emek Medical Center? First, as a major medical center, our physicians and professional staff are faced with difficult and often life or death situations / decisions every day. Fortunately for our patients, their assessments are based upon years of hard-earned knowledge, shared experiences, consultations and an ability to listen. Emek is located is one of the most volatile regions on earth and our life-saving abilities are often called upon as a result of actions by people who have nothing in common with our values or way of life. Politicians and theologians are often the catalytic forces behind crazed extremists and Emek’s multi-ethnic staff is often called upon to treat and save the multi-ethnic victims of such radicalism. Emek is a part of Israel and represents all that is sensible between people, however, many in this world blame Israel for the turmoil and conflict that destroys bodies and lives. Enough is enough! Israel is not the problem. Jews are not the problem. This conflict has never been about land or settlers or farms or cities. The real problem is blind theocratic hatred, fascist intolerance and a vile lust for political power that brings with it staggering amounts of unearned wealth (attained through taxation and gifts to “rulers” by well meaning countries who hope that their gifts will improve the lives of foreign populations). All too often those funds never reach their intended targets and end up lining the greedy pockets of immoral power grabbing gun-wielding despots. Examples of sanity may be found at eye level, if that is what you seek. Emek is a central player in the Jewish/Arab Middle East saga because here everyone meets everyone and here Jews, Muslims, Christians and Druze treat one another and heal together. Emek is an apolitical, often surreal Israeli phenomenon that doesn’t fit any established Middle Eastern mold. It’s simply a place where people care for one another and share a common value … life. 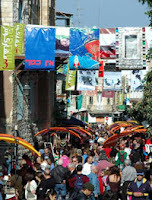 Emek exists in and is a thriving part of Israel. No such institution exists in any other Middle Eastern country. 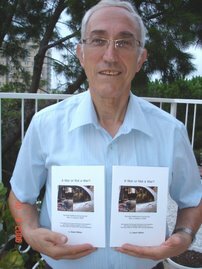 Emek is a wonderful example of humanitarian sanity; however it is not the solution to the infectious hatred running rampant throughout the Middle East. And Israel is not the problem. With the return to school completed this week, many pupils in Acco http://www.gemsinisrael.com/index000001057.htm found themselves in "smart classrooms". This has been the culmination of a joint project bewtween a numnber of organisations to equip the school with interactive boards instead of the traditional chalk boards, as well as computerised teaching stations and projectors, all networked for access by pupils at mobilecomputer stations. Pupils will be able to digitally raise their hands and ask questions, all integrated into the interactive board von the classroom wall. The Mayor, at the opening of the new school year, said that this epitomises the digital revolution in Acco and will alow pupils to expand their learning skills. So You Think You know the Terror Stats? In August 2011, there were 178 terrorist attacks carried out against Israel - a significant increase from the 53 that occurred in July. The data was published in a monthly report released by the Israel Security Agency. 134 of the terrorist events were rocket or mortar attacks. The main source of the increase was from the Gaza Strip, from which 135 attacks originated in August, compared to 20 in July. The most noteworthy terrorist attack that occurred last month took place on August 18 on the Israel-Egypt border north of Eilat. Eight Israelis (six civilians and two security forces members) were killed in that attack and 29 were wounded. An increase in terrorist attacks also occurred in Judea and Samaria, where 30 attacks occurred in August, compared to 25 in July. In Jerusalem, there was a slight decrease, with six attacks in August, compared to eight in July. On August 29, a Palestinian seized control of a taxi cab in Tel Aviv and ran into a number of people. He also stabbed people before being arrested. One Israeli was killed when a rocket fired from the Gaza Strip exploded in Be'er Sheva on August 20. Overall, nine Israelis were killed and 55 wounded in terrorist attacks in August. During August, 145 rockets and 46 mortars were fired at Israel from the Gaza Strip, compared to 20 rockets and two mortars in July.